Following are a series of long exposure images from the front and back beaches of Flinders on Victoria’s Mornington Peninsula. Pictured above – Flinders. 137 seconds f/13 ISO100. Available as a quality print at my Zazzle or RedBubble sites. Pictured above – Flinders back beach. 102 seconds f/20 ISO100. Available as a quality print in various forms and sizes here or here. Pictured above – Flinders beach. 141 seconds f/13 ISO100. Available as a quality print at my Zazzle and RedBubble sites. Pictured above – A Break from Fishing. Cormorants resting after diving for fish at Flinders back beach. 61 seconds f/11 iso100. Available as a quality print here or here. Pictued above – Flinders back beach. 56 seconds f/13 ISO100. Available as a quality print in various sizes and forms here at my Zazzle and RedBubble sites. When visiting Mystery Bay in New South Wales I found this wonderful cove full of dark rocks. The cove is open to the ocean and is constantly hammered by incoming waves. 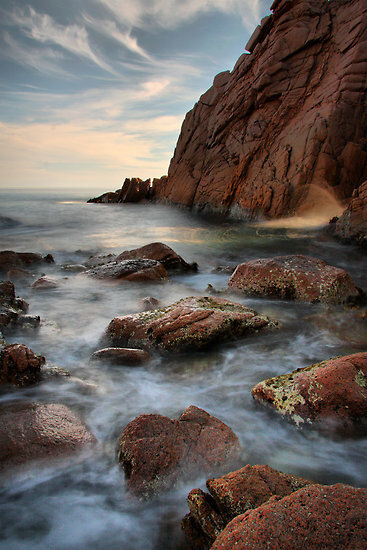 A long exposure here creates a nice contrast of textures between the rough jagged rocks and the softness of the mist created by the motion of the waves. High quality prints of this image are available at Redbubble and Zazzle. 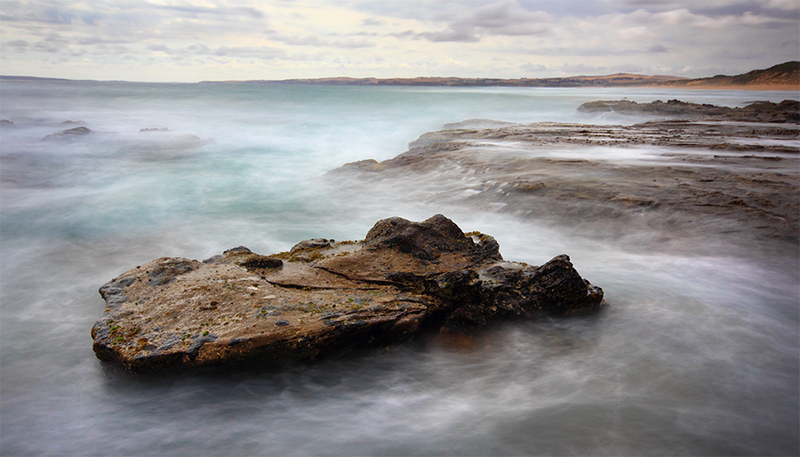 A selection of images from the beach at the end of the Blowhole Track at Flinders on the lovely Mornington Peninsula. On the day I was there the wind was so horrendously strong I had to push down hard on the tripod to stop it from vibrating and blurring all of the long exposure shots. Pictured below – Flinders Beach, the Blowhole Track. A very picturesque coastline battered by the relentless surf. 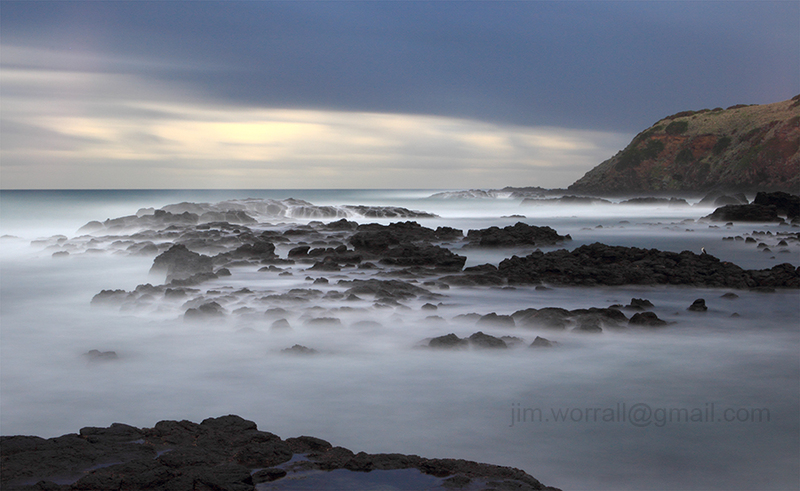 I’d been to this part of Phillip Island on previous occasions but I loved it so much I thought I’d revisit. That’s one of the joys of photography, you can visit the same location on several occasions and come away with completely different images each time. Pictured below – Old wooden remnants at Cat Bay, Phillip Island. Pictured below – The beach at Right Point, Phillip Island, located between Cat Bay and the Nobbies. The violence of the ocean waves smoothed by the use of long exposure. On an unseasonally warm winter’s day last weekend, I took advantage of the fine weather to reintroduce myself back to our fine ocean coastline. Technical stuff – The image was taken mid afternoon using an ND400 filter to lengthen the exposure time and thus soften the appearance of the sea. The following images were experiments using HDR tone mapping techniques combined with the effects of long exposure times. Each image was constructed from at least 3 separate exposures using in-camera auto exposure bracketing. In my case, being a Canon shooter, I used 3 exposures of -2,0 and +2 simply for convenience. I believe Nikon shooters have a bit more flexibility in this area. The images were all taken during daylight hours so it was necessary to use some heavy ND filtering in order to increase the exposure times and achieve a nice misty look to the water. In my case I used an ND400 and an ND8 filter stacked together to achieve this. The exposures were then combined and tonemapped using HDR software and tweaked in Photoshop to achieve the end result. Despite all of this sounding a bit technical it’s really quite simple and I encourage you to try it. The results are often very rewarding. 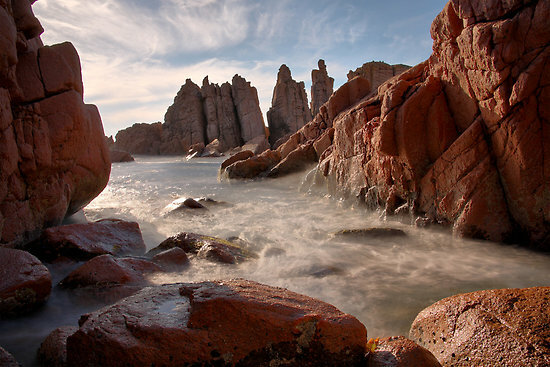 BELOW – Jurassic Afternoon – Sunlight and waves break through a slit in the prehistoric Pinnacles rock formation on Phillip Island. 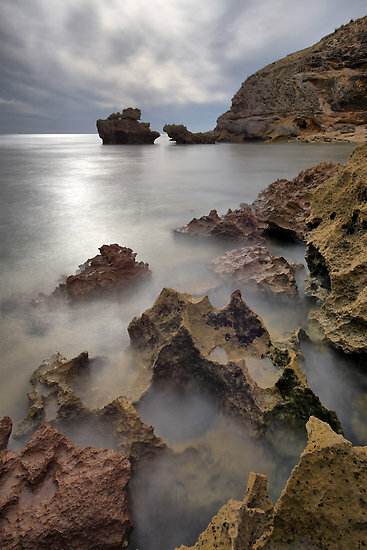 BELOW – The Mist of St.Pauls – A long exposure at St. Pauls beach, Sorrento, Victoria, Australia. 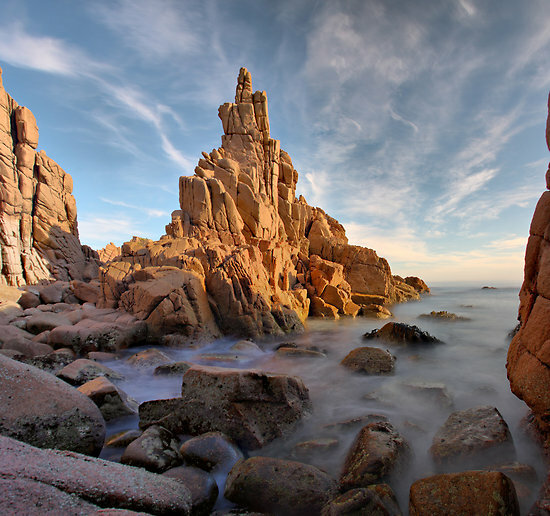 BELOW – Prehistoria – An image from The Pinnacles, at Phillip Island, Victoria, Australia. BELOW – Swimming with Dinosaurs – Down amongst the prehistoric Pinnacles rock formations at Phillip Island, Victoria, Australia. An alternative view of changes. 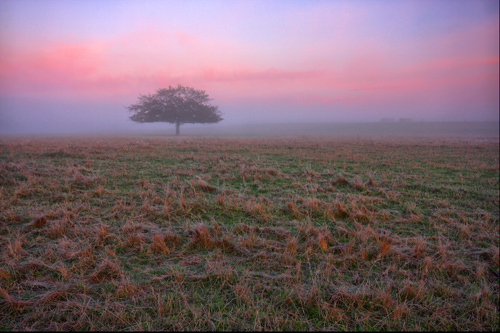 “Changes” was taken on a foggy autumn morning on farmland in Cranbourne, Australia. The lush green grass is such a contrast to the dry barren earth found on this spot during summer. Once again winter is nearly here in Melbourne. 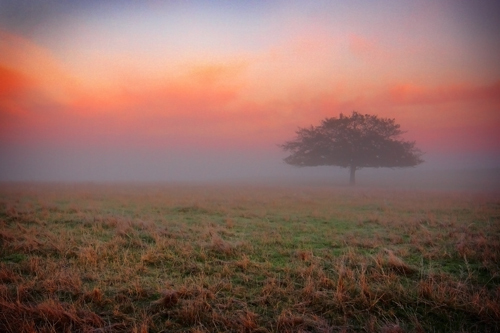 Thick morning mists form in low lying paddocks and create spectacular and brief pastel light shows. Both of these images are available for sale as prints on my Redbubble site.